Nestled quietly in the North Atlantic, frequently covered by ocean fog and sea mist, awaits a land of lush islands spouting endless adventures. Often overlooked by wandering tourists, this mystical land seems only to appear to travelers seeking while remaining hidden from those unknowing. Cascading waterfalls, crashing ocean waves, rolling green hillsides, expanding endless horizons; a real life fantasy landscape. These geographical droppings of an ancient basalt volcanic plateau are located nearly 400km southeast of Iceland and are known as the Faroe Islands. A self-governing region of the Kingdom of Denmark, the Faroe Islands have a fascinating history from which a unique culture blending various roots has risen. An often overlapping history with Iceland, the Faroe Islands are believed to have first been discovered by Irish Monks who told of the “islands of sheep and paradise of birds.” Not a far off description. Nowadays, the 18 islands have a total combined population of just under 50,000 people while it is estimated to be home to nearly double the sheep. Assuming you’re not a lamb connoisseur, the islands still boosts an array of adventures to be had. The outdoor culture has risen from ancestral origins in which villagers battled adverse conditions to provide food for survival. Popular methods of hunting and gathering included fishing, whaling, sheep herding as well as rappelling sea cliffs to collect bird eggs. Perhaps the most admirable and refreshing quality of the Faroese is the avoidance of cultural assimilation. Fermented meat, vikings songs, homemade wool sweaters, cobble stone steps, and the persistent sensation of community are all still alive and strong in the Faroes. However, the Faroese have noticed a disconnect between the older and younger generation. Many kids are inactive, disengaged, and uninterested in their heritage as well as the surrounding natural environment. With an intruding outside world through the bright screens of social media portals, some kids in the Faroe Islands may even wish they were born anywhere else but on an island in the North Atlantic. The middle generation, stuck in-between traditional roots and young ambitions, recognize this divide and are seeking to create solutions. Many companies have begun to develop within the Faroe Islands that help engage the younger generation with the environment while offering adventure activities sprung from traditional roots such as cliff rappelling and rowing. Additionally, tourists are beginning to visit the islands and stare in awe at the surrounding beauty while drooling over the endless list of outdoor pursuits. The validation of outsiders being blown away at the flourishing hillsides, authentic culture, cuisine, and endless exploration possibilities makes for a special sense of pride. Through this education and empowerment, some locals are beginning to feel an extra sense of gratitude for their culture and the islands. The instructors at Outdoor school on the island of Suðuroy have felt this sensation first hand. Jóni Brandsson, age 28, joined as a guide and educator in January. Prior to discovering the world of adventure sports, Brandsson often dreamt of life overseas and felt as though he was unlucky to be a kid growing up in the Faroe Islands. Then, one day, Brandsson had an epiphany—cliff jumping. He and Ossur Eiriksfoss had stared at the cliffs their whole lives and thought “why has no one done this yet?” Finally, they decided it was time to jump. Now, a few years later, Brandsson, Eiriksfoss and owner Petur Gotfredsson all work together at Outdoor to offer courses for high school students to learn adventure sports such as sea kayaking, traditional rowing, climbing, rappelling, snorkeling, and more. Having the ability to do all these activities in one day within walking distance from town has changed Brandsson’s mindset; “All I needed to know was that it was possible. Now that I know it is possible, the options seem endless. I am very proud and feel lucky to be Faroese.” Outdoor has completed their first year of educational programs and are now beginning to offer adventure guiding for tourists and visitors over the summer. With the Faroe Islands being rather undiscovered by the world of tourism, the list of untold local spots and insider tips is extensive. No one knows this better than Jóhannus Hansen of Reitka Adventures. As a local Faroese, Hansen has a fascinating history of personal experiences participating in traditional methods for hunting, gathering, fermenting, and more. In fact, Hansen grew up sky fishing for birds and even lowering his family’s sheep by rope down to steep sea cliff hedges. For his whole life, Hansen has explored endless sea caves, cliffs, and hillsides. Now, after starting Reitka Adventures, it’s how he makes a living. Connecting visitors to the unspoiled landscapes which he cares most about is something that brings an obvious joy to Hansen. Plus, his secret spots are stellar. An adventure to explore sea caves followed by rappelling an ocean carved gorge to land on a boat is one of the many itinerary options. Rappelling over the ocean onto a boat and then driving full speed away over crashing waves is the absolute best way to do so. With so much of the world documented, exploring somewhere not yet exposed is a beautiful sensation. 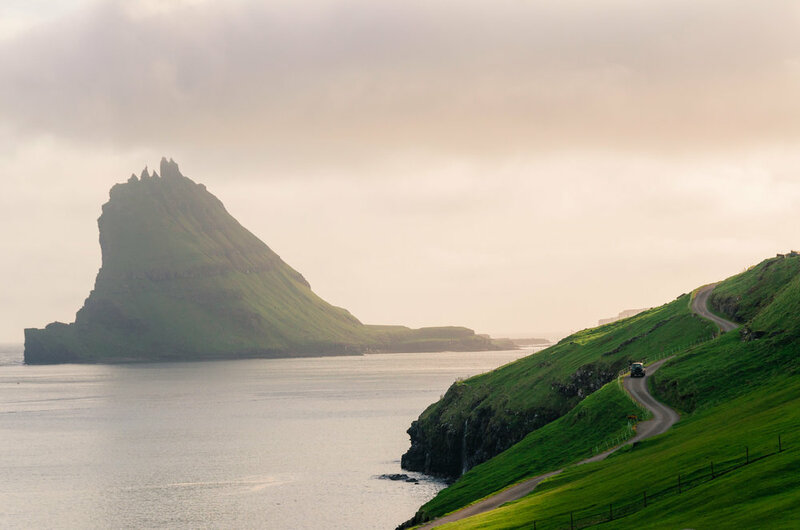 A culture of distinct authenticity with no commercialized facade to present, the Faroe Islands welcomes visitors and immediately removes the pretense of being labeled a tourist. When visiting the islands, the line between outsider and local does not divide, but rather creates a doorway for communication and exchange. Come and drink schnapps, explore with the locals, try fermented meat, sing a viking song or two but remember—this place is special. Explore with respect for the locals who value their history, traditional roots and sense of community. Sustainable travel isn’t only related to nature but to cultural preservation, too.